Mumbai: Sales of Hyundai Motor India Ltd (HMIL) and other auto makers received a boost in September from the festive season, considered to be an auspicious time for the purchase of vehicles and other consumer durables, and the availability of cheaper credit. HMIL, the country’s second biggest car maker by volumes, General Motors India Pvt. Ltd and Mahindra and Mahindra Ltd (M&M) posted record monthly sales in September, according to figures released by individual auto makers on Thursday. Buying by consumers to coincide with festivals such as Dussehra and Durga Puja as well as a low base effect helped push up sales. Sales at the same time last year were muted by a credit crunch and slowing economic growth. The credit crunch has since eased and interest rates on vehicle loans declined to 10-11%, from 12-13% a year ago. HMIL reported robust sales growth of 25% from a year earlier to 27,803 units in the domestic market in September, the highest ever for the company that drove into India in 1996. and launched its flagship model Santro. MarutiSuzuki India Ltd, the country’s biggest car maker, expanded September sales 10.7% to 71,594 units from a year earlier. The pace of growth eased from 29% in August and 27% in July, on account of capacity constraints at its manufacturing facility. 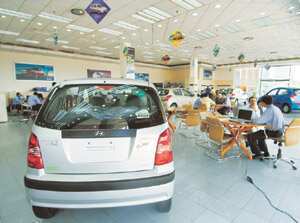 Tata Motors Ltd reported a 10% increase in sales of passenger cars, trucks and buses to 49,650. This included 2,524 units of the Nano, the small car billed as the world’s cheapest. Skoda Auto India Pvt. Ltd sold 1,854 units in the month, compared with 1,213 units a year ago. General Motors India’s sales rose 48% to 7,654 units, the highest monthly sales figure achieved by the company, the car maker said in a statement. Honda Siel Cars India Ltd sales surged 86.7% to to 5,794 units. Among two-wheeler manufacturers, market leader Hero Honda Motors Ltd sold 401,290 units, up 4% over the same month last year. TVS Motor Co. Ltd, the third largest two-wheeler maker by volumes, said domestic sales rose 11% to 132,281 units in September. Albeit from a low base, India Yamaha Motor Pvt. Ltd, the wholly-owned subsidiary of Yamaha Motor Co. Ltd, also reported robust sales of 26,394 units, up 160%. Sales at Suzuki Motorycles India Pvt. Ltd jumped 24% to 15,719 units on the back of its newly launched GS150 R motorcycle and Access scooter. With much of the festive purchases done in September, sales growth may ease in October on a month-on-month basis, said Nikhil Deshpande, an analyst at Pinc Research Ltd, a Mumbai-based brokerage. “Sales will be high again in the last two months of the year, with the low base effect kicking in," he said. An exception may be Hero Honda, which reported high, double-digit growth even during the downturn, he said.